May 1, 1945 ― Germany. On the eve of Berlin's collapse, a group of men and women carried out a certain ritual. To them, suffering defeat in the war meant nothing. If anything, the countless lives lost in the battle served as a catalyst to their sacrificial ceremony. Whether or not their attempt bore fruit ― not a soul knows. Following the war, they faded from sight, mind, and eventually into the realm of myth. rsprach Zarathustra -Die Wiederkunft-: Rewritten version of the original game, sprach Zarathustra contains only Kasumi and Marie's routes. Apparently, the VN's writer got writer's block during development, so a bunch of other people were hired to finish it for him. The result is supposedly a total mess. ~Acta est Fabula~: Adds Kei and Rea's route, the re-release of Acta est Fabula in Japan gives readers the choice between cropped and uncropped high-res images. However, since it's based on Acta est Fabula, it has none of Amantes amentes' additions. The patch version released by Views Co., Ltd was released on Kickstarter as a patch for the all-ages Steam version, but it does not contain the additional story content from ~Amantes amentes~. A route of the Steam version must be played to completion first for the patch to work. ~Amantes Amentes~: Amantes amentes adds some new content to Rea's route, including a second ending. It also has five side stories. However, since it was originally made for the PSP, all H-scenes were removed. Some of them got replaced with new content that serves the same purpose in a non-sexual way. Furthermore, there was plenty of other stuff that got censored, such as blood and references to nazism. 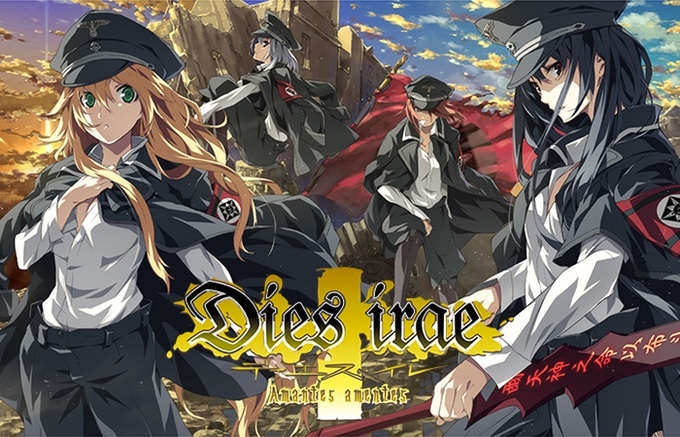 The Steam version has all the new content of the Japanese Amentes amentes, but lacks any of its censorship outside of H-scenes. It also has a higher resolution, but crops all the images. This release constitutes the common route, released as a free download. The character routes are bundled together and they are available as separate purchases, consequently the enforced route is removed. DX: Sold through MangaGamer's online storefront. Contains both ~Amantes amentes~ and ~Acta est Fabula~ as separate programs. The "Act Est Fabula" executable re-adds the enforced route order from the original, so Rea is only unlocked by beating Marie. Common (Chapters 1-6) –> Kasumi –> Kei –> Marie –> Rea (End 1>End 2). ~Amantes Amentes~ (Full story content) –> ~Act Est Fabula~ (Extra H-scenes). You can also do the opposite if you're interested in the Ero-scenes. It's strongly recommended that you follow the above route order, since this order will help you piece the plot together with a good progression and without confusion. You can opt to choose for the specific character route right from the title screen, but I recommend playing through the game the normal way. Other stories will unlock after completing specific routes. The Other Stories can be accessed from the main menu, under Other Story. One thing to note is that “Omnia vincit Amor” is essentially a Marie route epilogue, while “Nihil difficile amanti”, in a similar fashion, provides an epilogue for Rea’s route. As such, I would recommend reading those two extra stories immediately after finishing their respective routes. As for the other three side stories, I’d recommend reading “Wehrwolf” after finishing Kasumi’s route, then “Die Morgendämmerung” and “Verfaulender segen” after completing Kei’s route. Rea’s route has two endings. Go for Ending 1 first (“danced to the… etc. ), then Ending 2 (…sought the truth) afterwards for the optimal reading experience. Also, make absolutely sure you follow the walkthrough very closely. Particularly in Rea’s route, you need to pick “Look for Rusalka”, “Trust Rusalka” and “Rescue Rea Himuro”, otherwise you won’t see some very important optional scenes. Also Rea's route is unlocked after beating Marie's route (that only applies to the ~Act Est Fabula~ version, since all routes are unlocked in the english steam release). You can press F7 in-game to immediately jump to the next choice, while F6 will take you back to the previous choice. Also be aware that there are Notes left in the spoiler boxes, read them! Remember to save often on multiple slots. If you're playing the ~Act Est Fabula~ version, some choices may or may not appear since the enforced order is re-added, so ignore any choices that don't appear (choices that are unlockable are marked in italics to avoid any confusion, there is also a choice to have an h-scene with Kasumi or not around chapter 3 in the 18+ version). You can also go back to choices that weren't made in the guide to get extra flavor text. 10)Why’d you come to this city? 11)What do you plan to do with me? NOTE 1: Save here, so that you can have a shortcut to Marie's route. NOTE 2: Save here, so that you can have a shortcut to Kei's route. Load a save file (Choice 20) if possible. Load a save file (Choice 15) if possible. If You're playing the ~Act Est Fabula~ Version, you have to beat Marie's route to unlock Rea's. Though it is strongly recommended that you leave Rea's route for last! Remember to start a New Game! 13)Do I have no other choice? NOTE: Save here so you can proceed to the other end (End II). Load a save file (Choice 22). In the Other Story “Nihil difficile amanti”, you will be faced with a choice at one point (May the star that crawled upon the ground find happiness\May old promises be fulfilled). These lead to two different variations of the scene, so make sure to pick both choices if you want to see everything. This walkthrough is based on info attained on gareblogs and Otaku lair with some adjustments made by me. Port info gattered from the internet (Like this one) and other random posts on fuwa.